The insider advice on this page is from Wendy’s Trusted Travel Expert for Tahiti, Bora Bora and French Polynesia: Kleon Howe of The Art of Travel. When Kleon first sailed to French Polynesia more than thirty years ago, as part of an 11-year circumnavigation of the globe, he fell in love with the island’s people and their culture. He goes back several times a year—both to the more famous islands that attract first-timers and the lesser-known gems for his intrepid repeat clients—each time bolstering his vast array of contacts and experiences. Kleon sees each trip as a puzzle, with the traveler’s desires and interests as the pieces and his broad knowledge of the region as the blueprint to fit them together. 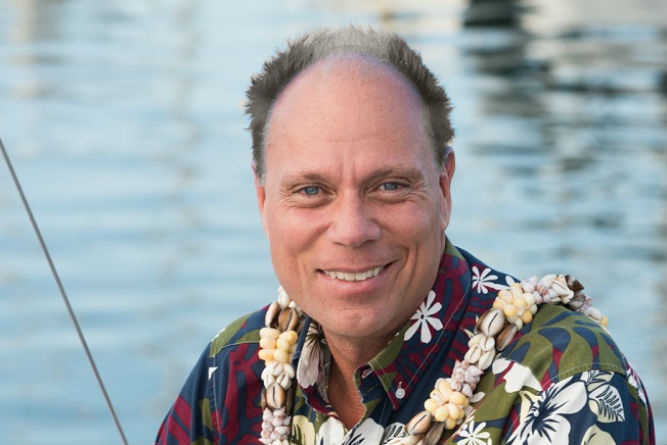 Since he books directly with companies in Tahiti—leaving out the U.S.-based wholesalers—his prices are competitive, and his clients get free services and amenities at virtually every hotel. As an experienced sailor and diver, Kleon knows the best locations and outfitters for those activities too. Kleon was also included in Perrin’s People, Wendy’s award-winning list of top travel specialists, which was published annually in Condé Nast Traveler magazine from 2000 to 2013. Vahine Island, situated on a reef surrounding the main island of Taha’a, is that dream we all have of Tahiti: a boutique hotel at what feels like the end of the earth, with just nine bungalows, plenty of privacy, excellent service, a sandy-floored restaurant with amazing food, and a new spa on a private motu (a little island) next door to Vahine. 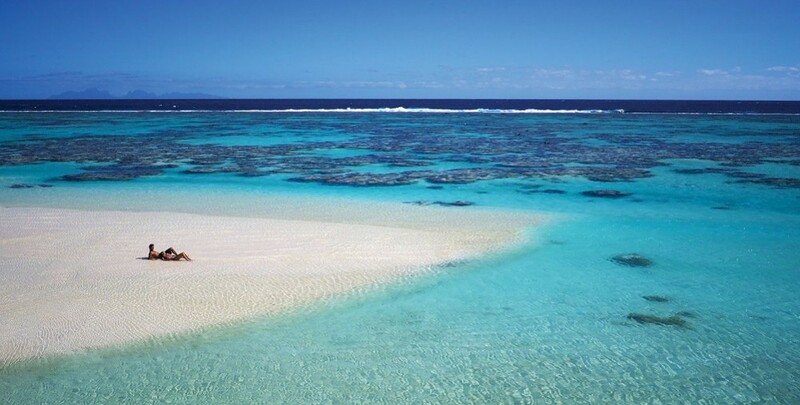 And because it’s on the reef, you can snorkel in a new place twice a day for an entire week. 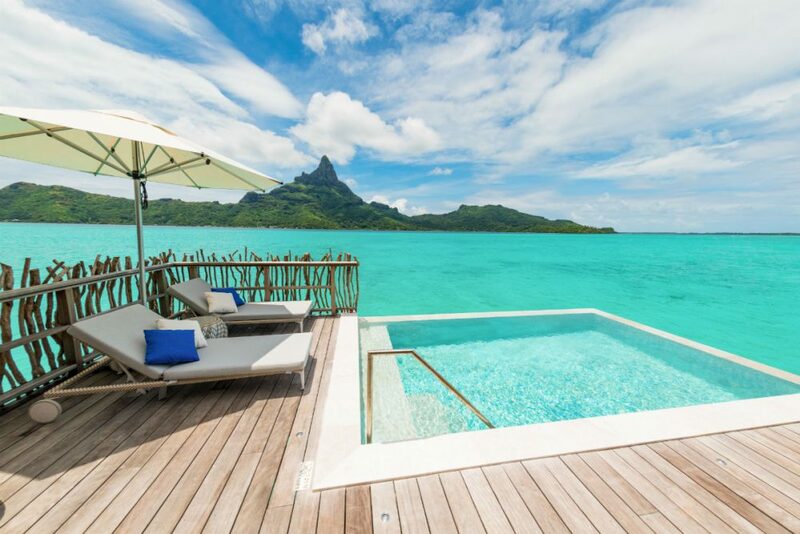 The three Beach Suites are a perfect prelude to an overwater bungalow on Bora Bora, which you can see in the distance. On the surface, The Brando looks expensive. But when you factor in everything that’s included—meals, drinks, many activities, one spa treatment per day, even the minibar—it’s actually quite a good value. So good that I always save it for last, because staying anywhere else afterward would be a disappointment. The resort, which opened on land that stole Marlon Brando’s heart 50 years ago, is mindful of its natural surroundings: The air conditioning comes from an innovative seawater cooling system, the villas disrupt the native vegetation as little as possible, and all the energy comes from renewable sources. I prefer staying on the lagoon side, where the sand slopes down into the water; on the ocean side, there is more coral, and the water isn’t nearly as clear. At Le Méridien Bora Bora, kids love visiting the Turtle Center, which rehabilitates injured turtles; it’s very interactive, and visitors of all ages can learn about the effects of rising waters on the lagoon and its coral ecosystem. The Two-Bedroom Pool Beach Villas are great for families: Since they’re on the inner lagoon, you don’t have to worry about your children stepping off into deep water or getting stung by a ray. One of the resort’s restaurants serves a buffet dinner three times a week. Staying at a pension can save you money and offer a more authentic Polynesian experience—but two things to note: Most pensions have fans but not air-conditioning, so they are best from May through October when the Trade Winds provide a refreshing breeze; and since they’re usually located a bit inland among the foliage, you should come prepared with mosquito protection. What Bora Bora was 40 or 50 years ago, its smaller neighbor of Maupiti is today: an authentic South Pacific isle with unblemished white-sand beaches and—thanks in part to the lack of overwater bungalows or wave riders—a large lagoon so full of life that you’re likely to see eight or ten manta rays in a single snorkeling session. The only accommodations on Maupiti are pensions (small, family-run hotels), and the best of these is the very reasonable Pension Tereia. The three rooms are small and simple, right in the owner’s house, which is just a few minutes’ walk from the beach. There is free Wi-Fi, but no phone service. The food is very good; ask for the coconut curried shrimp. Les Relais des Josephine sits right on the edge of the pass into the island of Rangiroa, in the Tuamotu archipelago. Though there is no beach here to speak of, all seven of the colonial-style bungalows have a perfect view of the dolphins that frequently play in the currents. You can organize a drift dive or snorkeling trip to see these dolphins up close, as well as large schools of fish and—if you are lucky—even a hammerhead shark. But the real draw is the dining: Les Relais is well known for its fine French cuisine. The menu is set, but if you have any restrictions we can talk to the chef. The Blue Banana in Punaauia, just outside Papeete, is right on the water—some of the tables are even on a pontoon floating on the water. This place isn’t fancy, but the location is quite romantic. It’s easy to get there from the Intercontinental, Le Meridien, and the main city of Papeete. My favorite dish is the coconut curry shrimp. Fare Manuia is a local hangout on Bora Bora, near the Intercontinental. There’s often live music, and you can just put your feet up and relax. I really like the mahi mahi with the coconut sauce—but I order the sauce on the side so that I can fully savor the fresh fish! Poisson Cru: This is a raw fish dish, usually tuna that has been marinated with coconut milk, lime, and vegetables. The preparation is a bit like ceviche, but the flavors are totally different. Everyone makes their own version, but my favorite is at Snack Mahana, next to the Intercontinental Moorea. Go early for lunch, because that’s when the locals will be eating! The Polynesian dance show at K Restaurant at the Sofitel Ia Ora Beach Resort on Moorea is far superior to the touristy offerings you’ll find elsewhere. Between each course of chef Guillaume Burlion’s creative cuisine, dancers appear in new costumes to act out the local legends of Moorea and Tahiti. I prefer the tables on the beach, where you can nestle your toes into the cool sand and enjoy the most amazing view of Tahiti in the distance. Reservations are necessary whether you are guests of the resort or not. Chef Damine Rinaldi Dovio, of the famed Villa Mahana, recently opened Villa Matira on the top of the same-named point on Bora Bora; here he prepares recipes from his home island of Corsica with Polynesian ingredients. He books only one group per day for lunch (which I recommend over dinner, since you’ll appreciate the nearly 360-degree views of the lagoon in daylight), so you’ll have the run of the place and ultimate privacy. 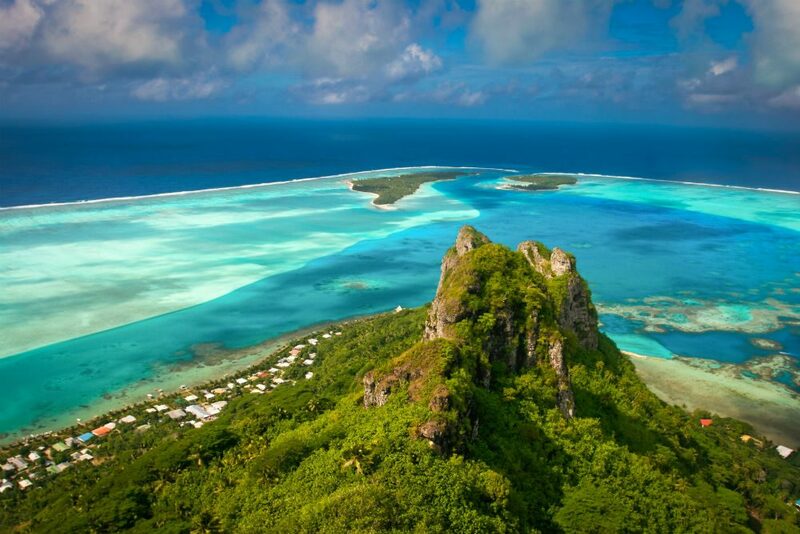 The main island of Tahiti. 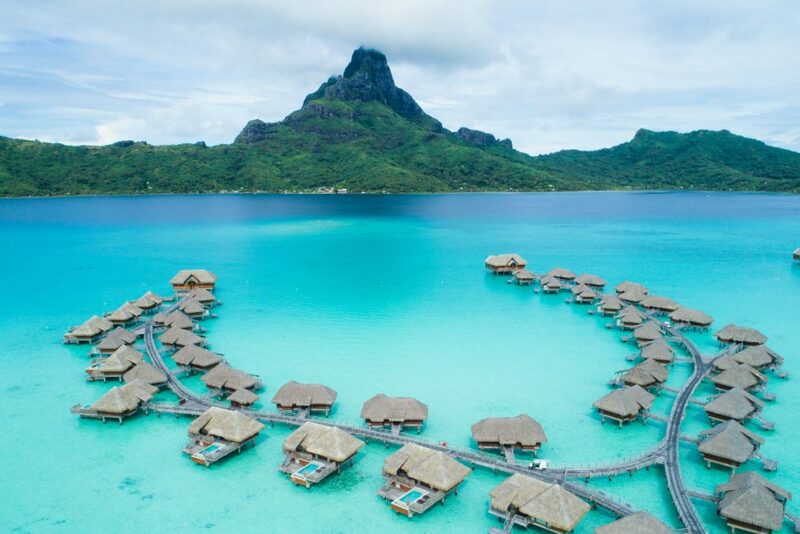 Most visitors think of it as just a stopover on the way to other islands, but there’s a lot to do and see here, and it’s less expensive—so with the money you save during a few nights here, you can splurge on an overwater bungalow later in the trip. You can shop for Tahitian-style fabric in the main market, learn to surf, dine with locals at Chez Roger, dive or snorkel, visit the Museum of Tahiti or the Black Pearl Museum, or go further afield to the beautiful Papenoo Valley or the Marae Arahurahu—one of the best-reconstructed marae (sacred places) on the island. In the south of Tahiti, called Tahiti Iti (iti meaning little), is the famed surf location of Teahupoo. This is the rugged and mountainous area where the southern ocean seas curl onto the reef. Apart from a major surf competition in August, this area is sleepy the rest of the year, but you can go out in a boat to see the monster waves up close. In its heyday, Bloody Mary’s, on Bora Bora, was full of celebrities. Now that the original owner has retired and his sons have taken over, the food is just O.K. and even the namesake drinks aren’t great. For a nice waterside meal on Bora Bora, I much prefer Mai Kai, Restaurant St. James, or Matira Beach. Point Venus, on Tahiti, is where Captain Cook observed the transit of Venus in 1769. The park around the lighthouse that now stands here is an ideal picnic area, with spectacular views of the coast and Papeete in the distance. This beach also has a great surf break for all levels and ages. (Do note that the beach is not white-sand, but brownish-black). On the way there, stop at the Tahara’a lookout, at the top of the hill just above the Pearl Beach Tahiti, for another pretty view, this one all the way to Moorea. Ninamu Resort, once a cult surfing hotel, underwent a major renovation into a quirky resort for all types of travelers. Each of the seven bungalows are unique, like something out of a Dali painting or a Tolkien book, and all are crafted from local materials, including coral, stone, and thatch; one is arranged specifically for families. There’s no air-conditioning in the bungalows, but with the breeze the fans are enough. 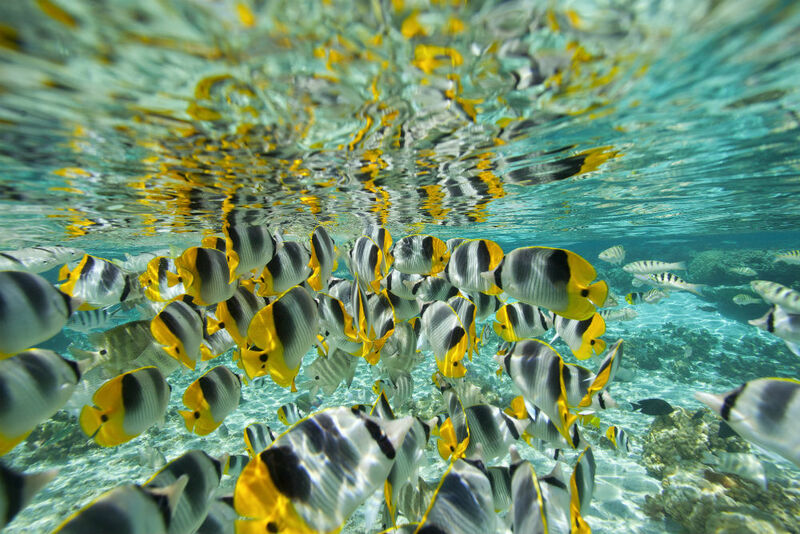 Ninamu is situated on remote Tikehau, which—unlike Bora Bora and Moorea—is an atoll, with different wildlife, which you can experience by snorkeling and visiting Bird Island, an avian sanctuary in the lagoon. Opoa Beach Hotel on Raiatea is a secret little place in a tropical valley right next to a local village and near some of the most important ancient and sacred places in the islands (including Taputapuatea, which was once the seat of the local Polynesian dynasty that ruled this part of the islands). 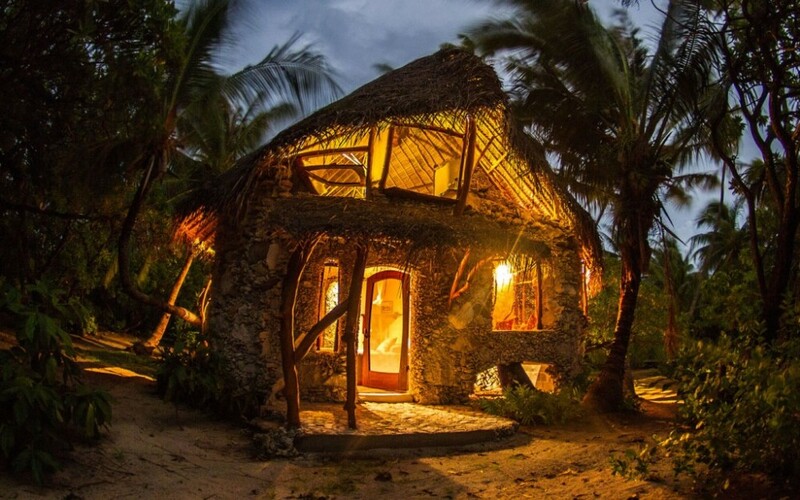 The place is a labor of love for a French couple who were formerly caretakers at Vahine Island. Book one of the three beach bungalows, which have a separate sitting area with a view of the ocean. If you are lucky, one the short afternoon rains will come and the sound of the rain on the metal roofs will lull you to sleep. The beach is small, but there is great snorkeling at the end of the pier, and free transfers to Bird Island for more beach access and snorkeling options. The bungalows currently only have fans but will have air-conditioning by the end of 2019. On some days, the hotel offers free transfers to the market and small town. Visit a Protestant Church during Sunday service. You need do no more than stand under a shady tree near the church to listen to the unique a cappella singing floating out of the open windows. It is pure joy. You’ll also get to see the impressive hats that the local ladies weave and wear, each trying to outdo the others in a friendly competition. Bike around Bora Bora. There are a few small hills, but most of the 18-mile route is a leisurely pedal past local villages, beaches, cafés, small shops, and the market. Start around 9 a.m. so you miss the school bus and have the road mostly to yourself until you get close to the main village of Vaitape. Pace your trip so that you can have lunch at Snack Matira on a white-sand beach that slides into the turquoise of the Bora Bora lagoon. You’ll need a car or scooter to get to Belvedere Lookout Moorea, but it’s worth it for the view of both bays of Moorea: Cook’s Bay to the right and Opunohu Bay on the left. Bring a towel to sit on, and stop by any of the small stores on the way up for a sandwich. The ridge of peaks you’ll see between the two bays is a great hike, but you’d need a guide for that. During the “Trade Wind” season, from mid-June through mid-October (locals call this time the Mara’amu), the breezes keep temperatures in the low 80s and the humidity down as well. It’s my favorite time to visit, as you have the most full-sunshine days. It still rains, but in 30- to 40-minute bursts, and then the sun comes out again (a cycle that can repeat a few times through each afternoon and evening). 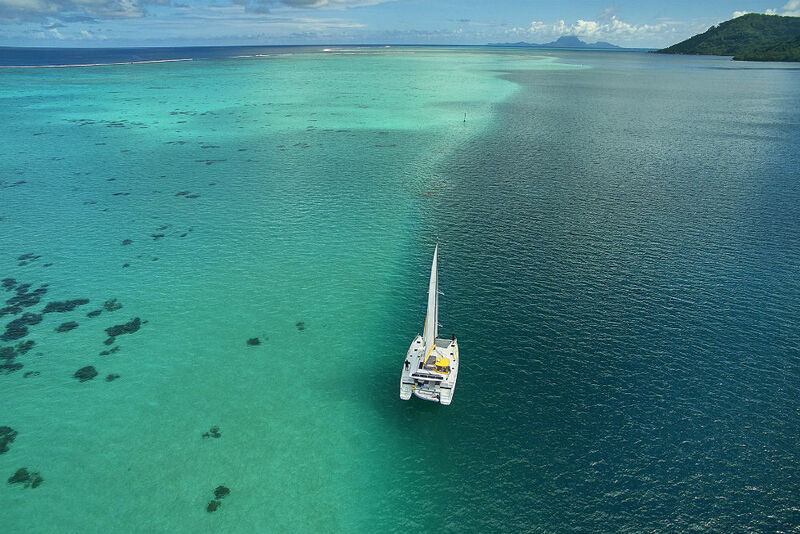 The lagoons can be a bit choppy, but it is great for kite surfing, catamarans or outrigger canoes with a sail rigged and, of course, sailing. The “Heiva” festival falls during July, with the culmination of ceremonies in Papeete, Tahiti around the 20th. Heiva is a celebration of life and all things Polynesian. During the beginning weeks of the month, the outer islands hold local contests—in everything from outrigger racing to stone carrying and spear throwing, traditional dancing and singing to Tifaifai (quilt) making—and the best go to Tahiti for the main festival. January through March, due to the increased rain. The high humidity also tends to increase the populations of mosquitoes and flies outside the resorts (which keep bugs in check by reducing standing water and raking the sand). In El Nino years, there is also a higher possibility of hurricanes during these months. The upside is that pricing for hotels, resorts, and pensions (locally owned bed-and-breakfasts) is the lowest of the year, typically 15 to 20% off peak rates. Booking the wrong overwater bungalow: At each resort, the least expensive of these bungalows often have views of other villas—not the never-ending water views you might expect. Before booking, request an updated map of the resort so that you can verify what view you’ll have. Pre-booking activities that fill your days: Some travelers worry that they will be bored during their trip, so they pack their schedule with guided activities. This, however, leads to burn out for a number of reasons: 1.) no relaxing and recharging time; 2.) a lot of exposure to the strong sun; 3.) missing the opportunity to meet the local people in the villages, markets, and parks. 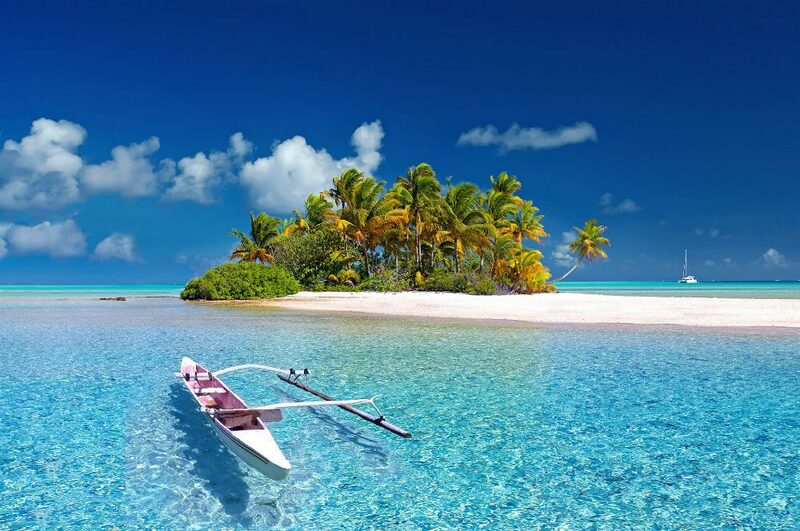 Instead, book a half-day tour of the island or lagoon on the first or second morning (the coolest part of the day). The destination guide that I send to each client has a full list of activities, which can be booked once you are on island (though any private tours tend to sell out in advance). There is no tipping in the islands, except at resorts with butler service and on private chartered yachts. The Polynesians really do consider travelers honored guests, so to force them to tip does not make sense to the locals. For a Tahitian, maururu (“thank you”) is worth much more than a tip. If someone goes above and beyond for you, don’t hand a tip to that individual; put it in the communal tip box found at the front desk of every resort. The famous Black Pearls of Tahiti (which grow here because of the unique color of French Polynesia’s mollusk shells). The pearls are not really black, but run from a dark aubergine to a light pink, with blues, greens, and rusty-colored ones too. You can purchase one at a pearl farm—where they’ll also show you how the pearls are cultivated—from one of the large chain stores like Robert Wan, or from an independent village artisan (their roadside shops are generally open from 10am to noon, then close for several hours over lunch). Settings for men are limited; a good place to look for one is in the main market of Tahiti. With any pearl you buy, make sure you receive a certificate from the government proving that the pearl was harvested at the proper size. An Off! Clip-on mosquito repellent fan, which works great when you’re sitting still—such as at a dining table or while reading on the beach. (It doesn’t work so well while you’re walking.) It’s particularly helpful for people whose skin is irritated by topical repellents. Reef-safe sun protection: Many sunscreens contain ingredients that are harmful to sea life (oxybenzone and octinoxate, for example, have been banned by the state of Hawaii). Surprisingly, one of my favorites is from the Bora Bora airport, which is on a motu, or small island, on the reef surrounding Bora Bora. When you arrive and walk through the small terminal to where the boat transfers are waiting, you have one of the best views of Bora Bora and its main peak, Otemanu, with the many colors of the lagoon—white to turquoise to dark blue—in between. On Moorea, the Toatea lookout, just above the Sofitel Ia Ora Resort, has a sweeping view of the east coast and Tahiti in the distance. Carvings that are sold as Marquesan, but don’t come from there; you’ll see these everywhere. Authentic ones are available at better shops in Papeete and in the outer islands, but in the main market of Tahiti and elsewhere, many have been mass-produced in Asia. Marquesan carvers always include their signature on each piece; if you don’t see one, the carving isn’t authentic. The Papeete airport boarding area has only slow fans to move around the heavy tropical air—but a moderate day rate will gain you access to a new business-class lounge, which is air-conditioned. Air Tahiti Nui has long received complaints for its aging fleet; good news, then, that their new three-cabin Boeing 787 Dreamliners will start flying by September 2019.